Heat oven to 375°F. Grease cookie sheet. In medium bowl, beat cream cheese, milk and butter with electric mixer on medium speed until smooth. Stir in turkey, rosemary, green onions and bell pepper. Unroll dough; cut into 4 rows by 3 rows to make 12 squares. Spoon about 1/3 cup turkey mixture onto center of each of 6 squares. Top with remaining squares; firmly press edges with fork. Place on cookie sheet. Brush tops with egg; sprinkle with Parmesan cheese. 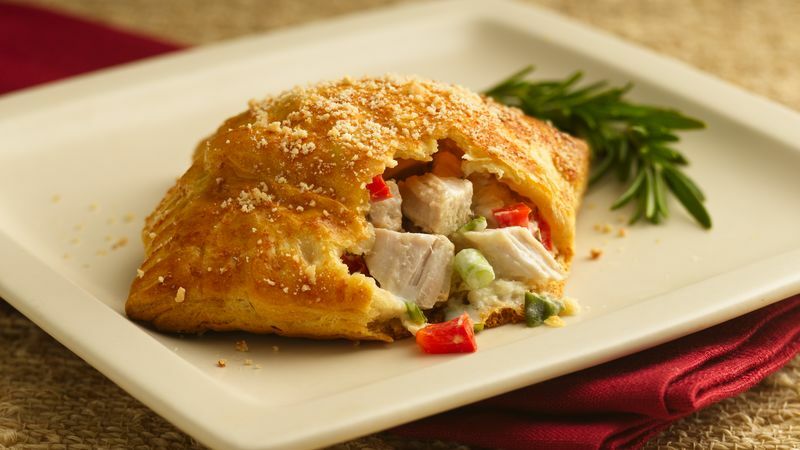 Use turkey leftover from the Thanksgiving feast for a creative, no-hassle next-day dinner!